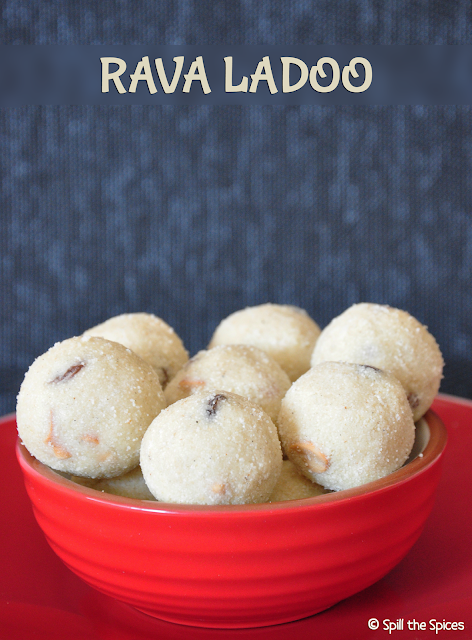 Rava laddu or rava laddo is a quick and delicious sweet made with semolina, ghee, cardamom, dried fruit and nuts. It is one of the common sweets made during special occasions and festivals like Diwali, Vinayaka Chaturthi and Krishna Jayanthi. Rava ladoo can be prepared with different variations like adding coconut and condensed milk, but this reduces the shelf life. Few add saffron also to give a slight yellowish color. Here in my version, I have made the laddu entirely with ghee, which increases the shelf life. Some people prefer smooth laddu while others love to bite into the grainy ones. So grind the rava to the texture you like. 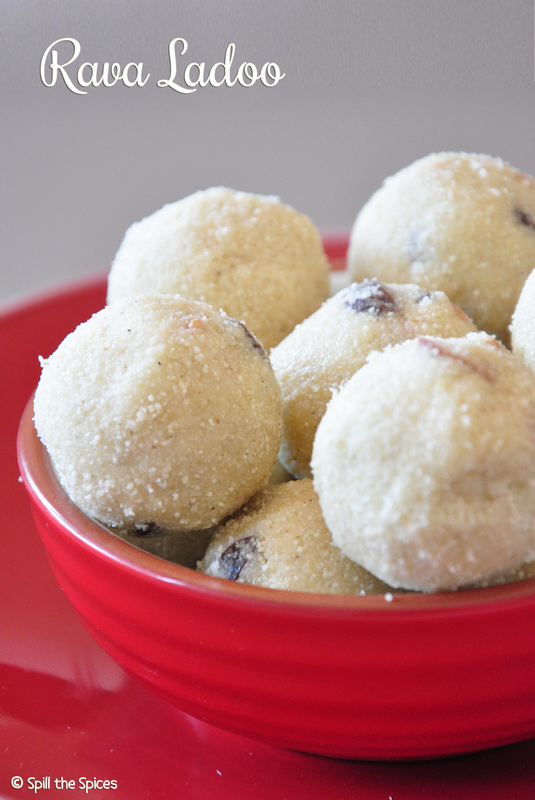 These easy melt in mouth rava ladoo were done in less than 30 minutes. Store in air tight container and relish for a week. Am sure it won't last till then! 1. Heat 1 tsp ghee in a pan. Add the cashew nuts and fry till golden. Set aside. Now add the raisins and fry till they puff up. Set aside. 2. In the same pan, add the rava. Roast in a low flame stirring often, until nice aroma comes. 3. Cool and powder the rava to a fine grain consistency. If using fine kind of rava, you need not grind. Set aside. Powder the sugar. 4. Sift together rava, sugar and cardamom powder. Add the fried cashew nuts and raisins. 5. Melt the rest of the ghee and pour into the rava mixture. Combine well with a spoon. 6. When mixture is warm, make small lemon sized balls. Allow it to rest for 1 hour. Store in an airtight container. 1. Take care not to brown or burn the rava while roasting. 2. If mixture is too dry and does not form balls, add little more ghee or milk to bind. 3. You can reduce the amount of ghee and add milk instead, but this will reduce the shelf life. 4. The laddu will be soft to touch while making but will harden and set after sometime. Perfectly made rava laddu.. Very tempting..
You know what? I am gonna make this ladoo in a couple of hours. Have all the ingredients on stand-by. I have seen the same recipe, shared by many foodies and it tempted me. 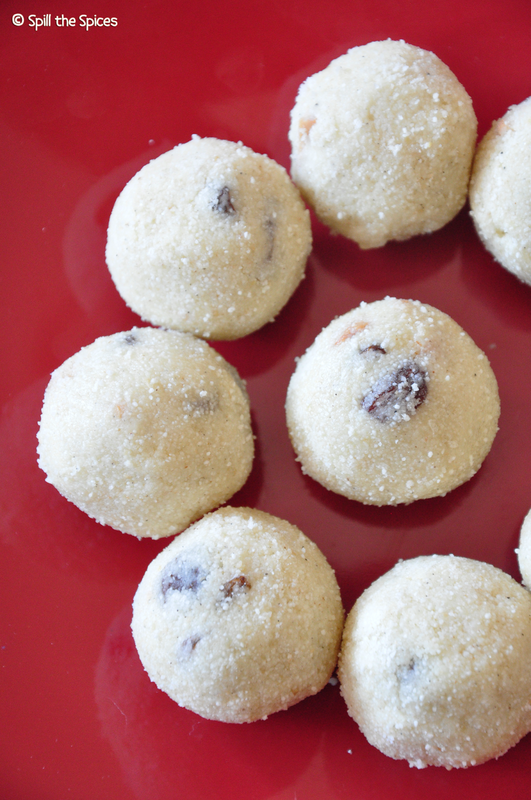 Thanks for sharing on how to increase the lifespan of the ladoo, that being adding more ghee. Just a beautiful and inviting sweet. laddus luks very delicious and really mouthwatering. Rava laddu looks so delicious and yummy. Nice clicks! Love it any time and yours looks delicious!